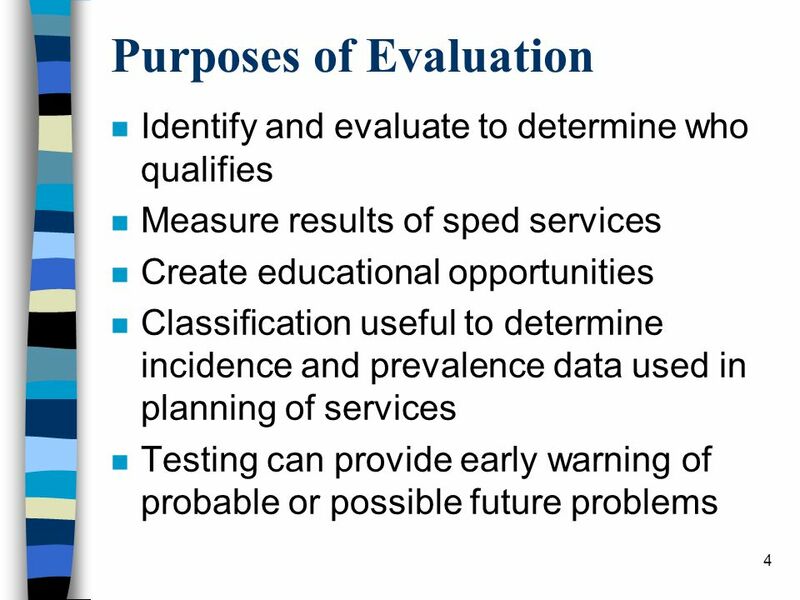 Identification, Assessment, & Evaluation. 2 More Than Just Zero Reject: n Zero reject is a rule against exclusion. n However, once a student is admitted. 2 2 More Than Just Zero Reject: n Zero reject is a rule against exclusion. n However, once a student is admitted into school system, need to assure BENEFIT…more is required. n “More” begins with an evaluation of student’s strengths and needs. 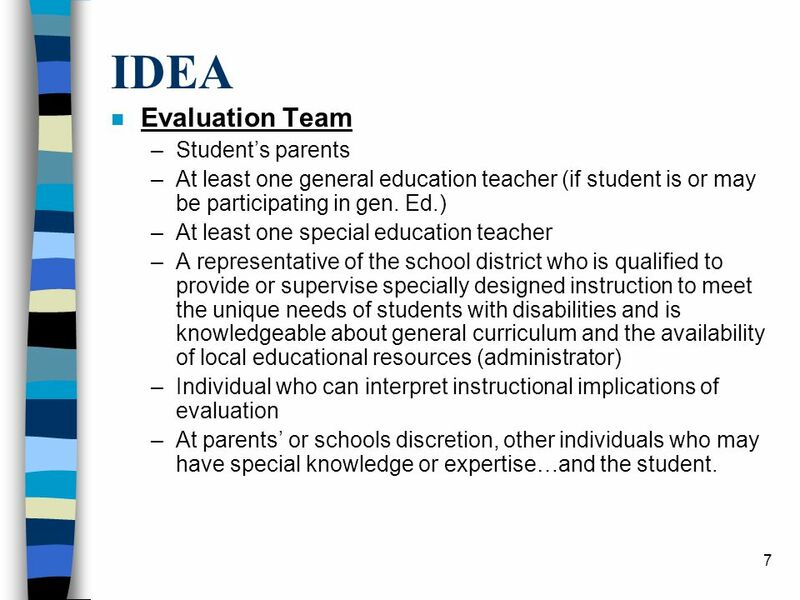 7 7 IDEA n Evaluation Team –Student’s parents –At least one general education teacher (if student is or may be participating in gen. Ed.) 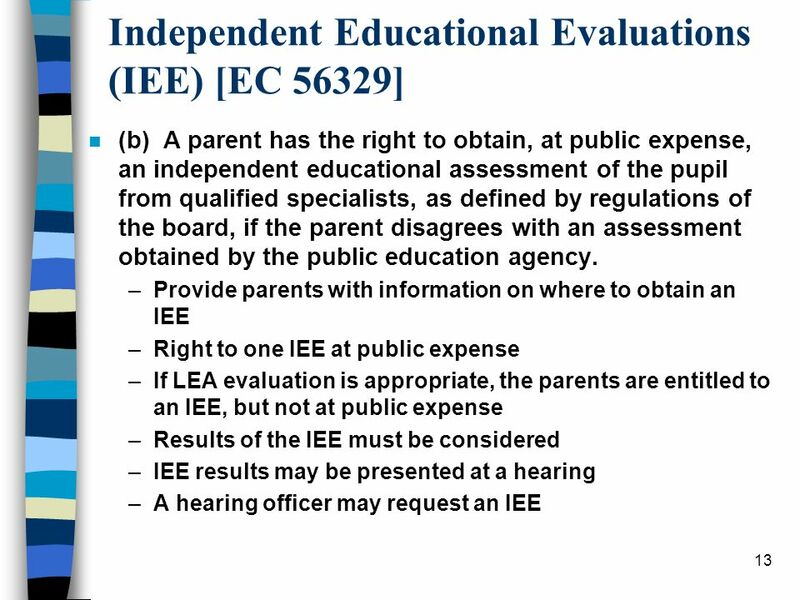 –At least one special education teacher –A representative of the school district who is qualified to provide or supervise specially designed instruction to meet the unique needs of students with disabilities and is knowledgeable about general curriculum and the availability of local educational resources (administrator) –Individual who can interpret instructional implications of evaluation –At parents’ or schools discretion, other individuals who may have special knowledge or expertise…and the student. 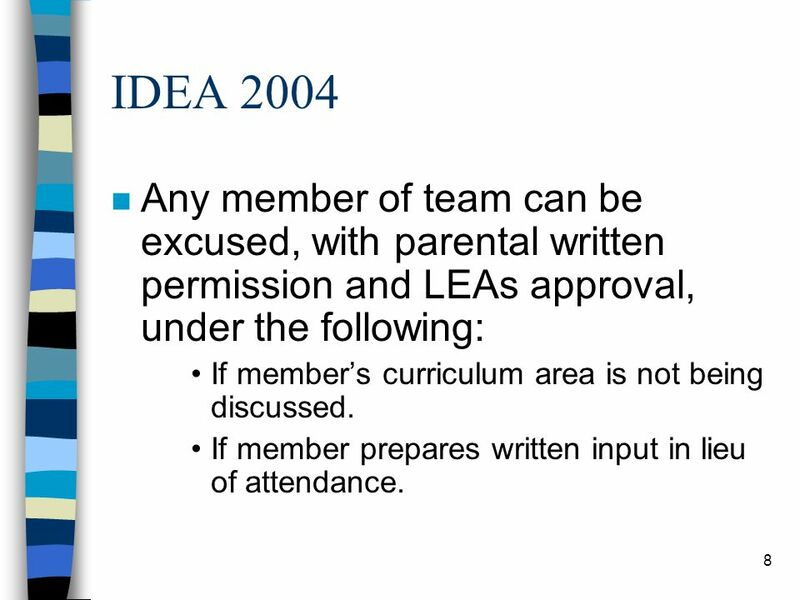 8 8 IDEA 2004 n Any member of team can be excused, with parental written permission and LEAs approval, under the following: If member’s curriculum area is not being discussed. If member prepares written input in lieu of attendance. 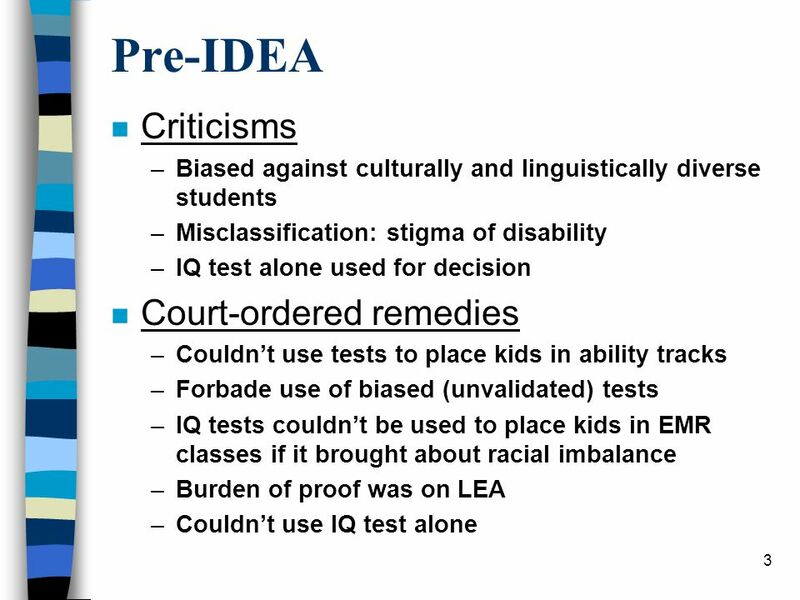 9 9 IDEA n Standards and Procedures –Student: Test & eval materials not be discriminatory on racial or cultural basis and Test & eval materials are administered in “the language and form most likely to yield accurate information on what the child knows and can do academically, developmentally, and functionally.” Test and eval materials for ELL measures whether child has a disability and need for sped RATHER than English language skills. –Tests’ Validity & Administration Validated for purpose to be used Administered b y trained & knowledgeable personnel Administered according to instructions from test producer. 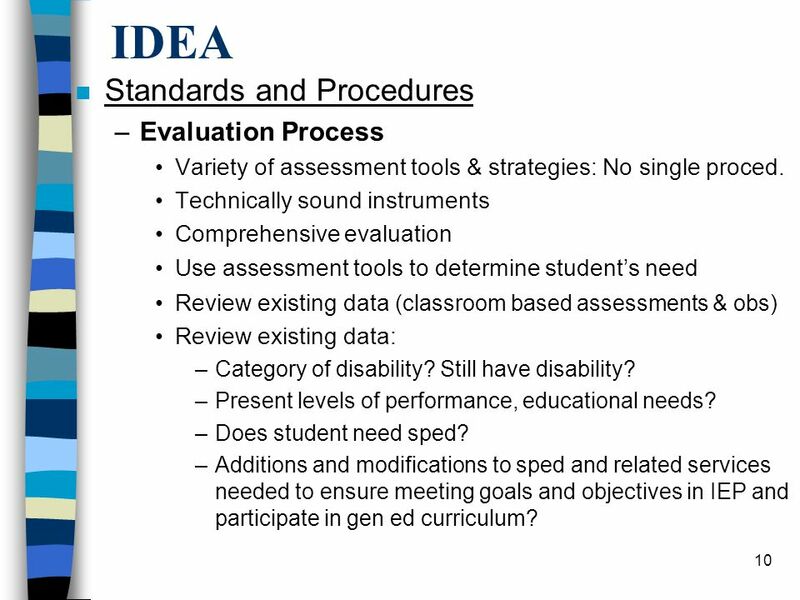 10 10 IDEA n Standards and Procedures –Evaluation Process Variety of assessment tools & strategies: No single proced. 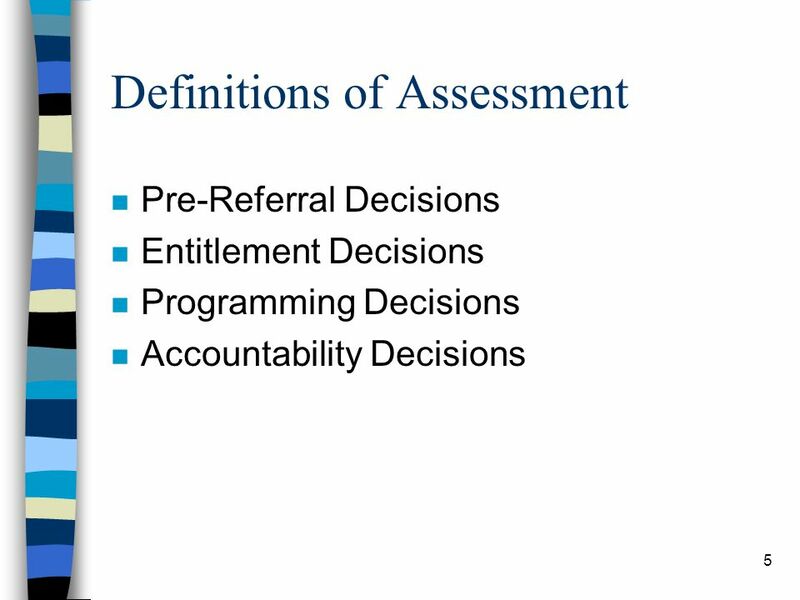 Technically sound instruments Comprehensive evaluation Use assessment tools to determine student’s need Review existing data (classroom based assessments & obs) Review existing data: –Category of disability? Still have disability? –Present levels of performance, educational needs? –Does student need sped? 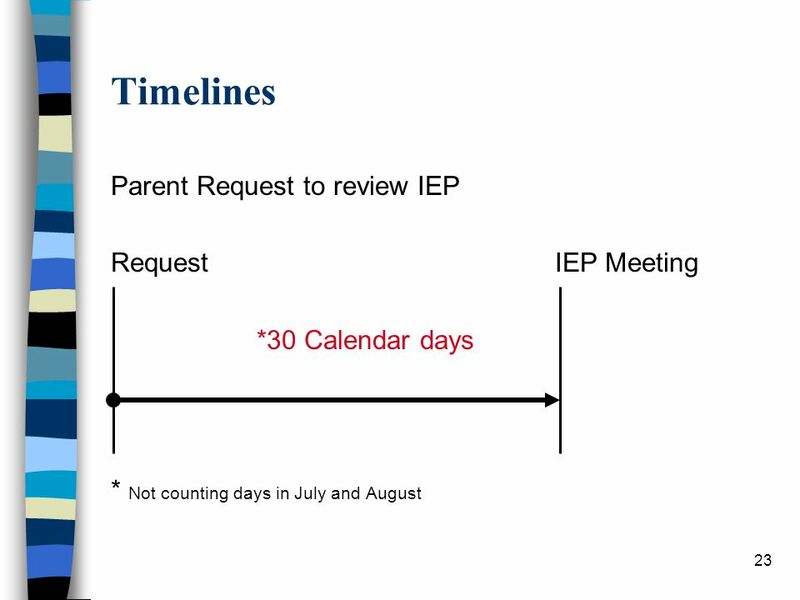 –Additions and modifications to sped and related services needed to ensure meeting goals and objectives in IEP and participate in gen ed curriculum? 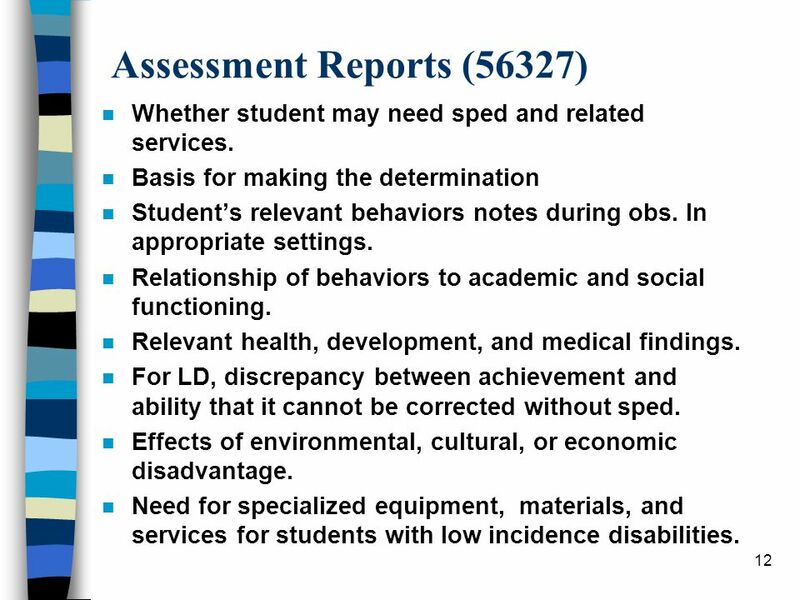 12 12 Assessment Reports (56327) n Whether student may need sped and related services. n Basis for making the determination n Student’s relevant behaviors notes during obs. In appropriate settings. 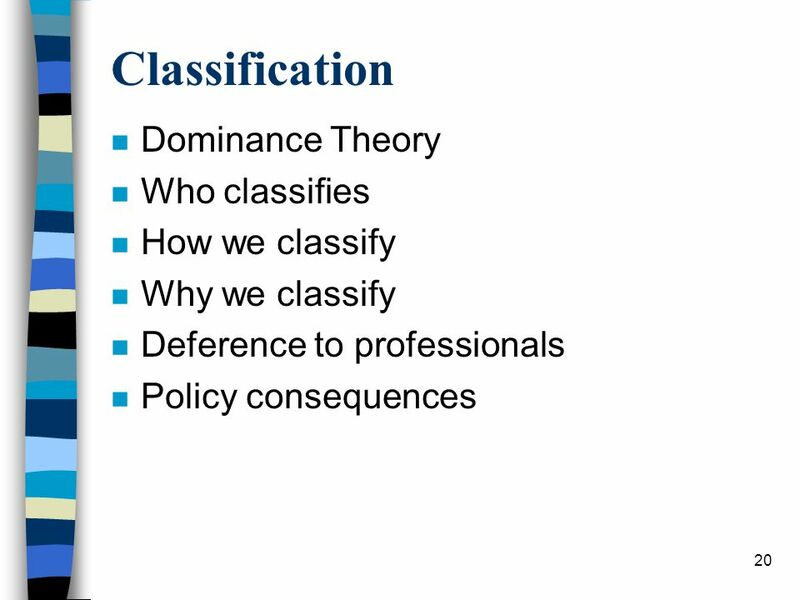 n Relationship of behaviors to academic and social functioning. n Relevant health, development, and medical findings. n For LD, discrepancy between achievement and ability that it cannot be corrected without sped. n Effects of environmental, cultural, or economic disadvantage. 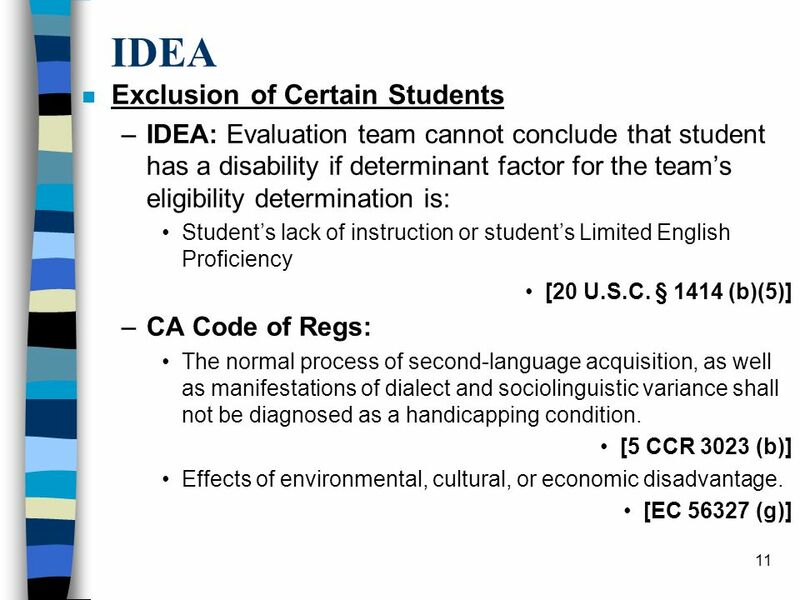 n Need for specialized equipment, materials, and services for students with low incidence disabilities. 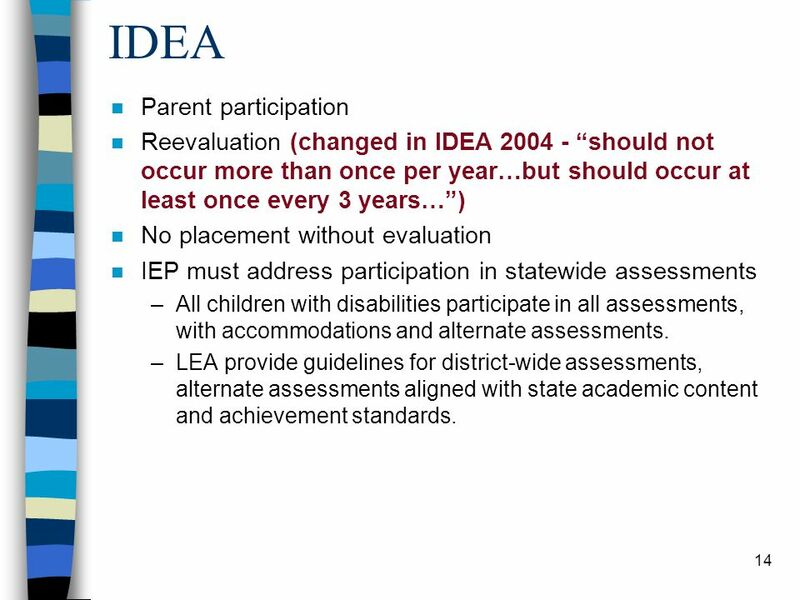 14 14 IDEA n Parent participation n Reevaluation (changed in IDEA 2004 - “should not occur more than once per year…but should occur at least once every 3 years…”) n No placement without evaluation n IEP must address participation in statewide assessments –All children with disabilities participate in all assessments, with accommodations and alternate assessments. 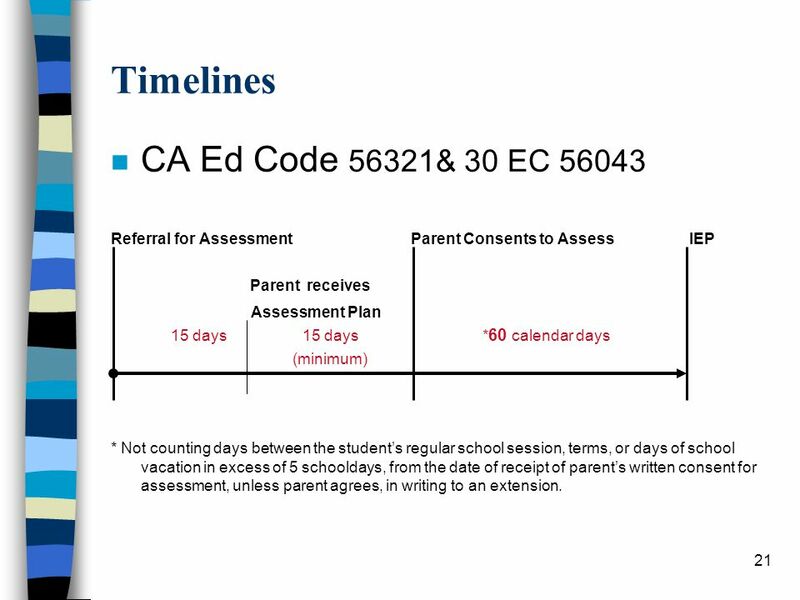 –LEA provide guidelines for district-wide assessments, alternate assessments aligned with state academic content and achievement standards. 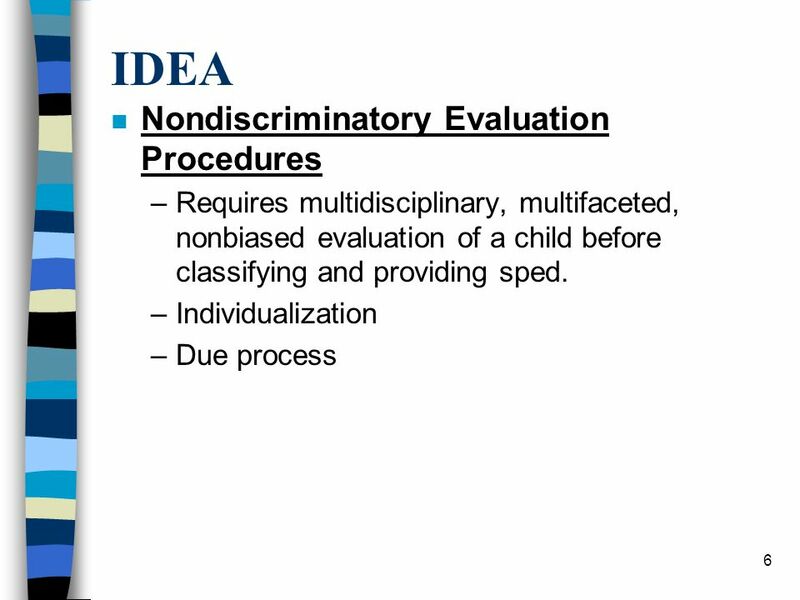 15 15 IDEA 2004 definition: SLD Specific Learning Disabilities: (a). 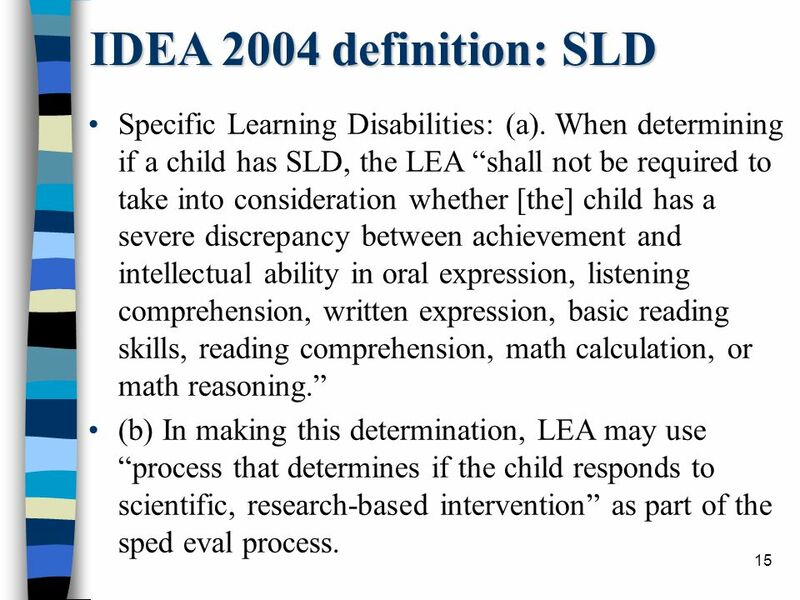 When determining if a child has SLD, the LEA “shall not be required to take into consideration whether [the] child has a severe discrepancy between achievement and intellectual ability in oral expression, listening comprehension, written expression, basic reading skills, reading comprehension, math calculation, or math reasoning.” (b) In making this determination, LEA may use “process that determines if the child responds to scientific, research-based intervention” as part of the sped eval process. 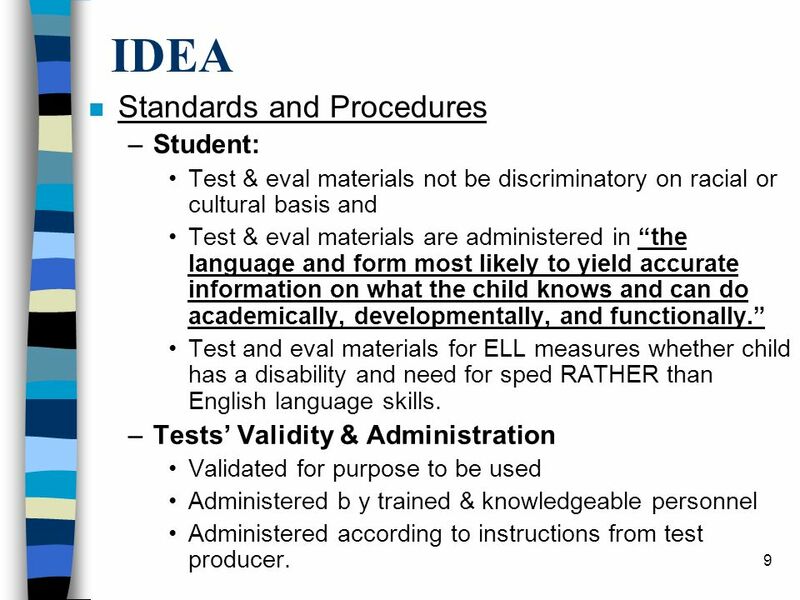 16 16 SLD Definition (Cont’d) n For SPED eligibility in general: Child will not be determined a “child with a disability” if the determining factor is “lack of appropriate instruction in reading, including in the essential components of reading instruction” (as defined in NCLB). 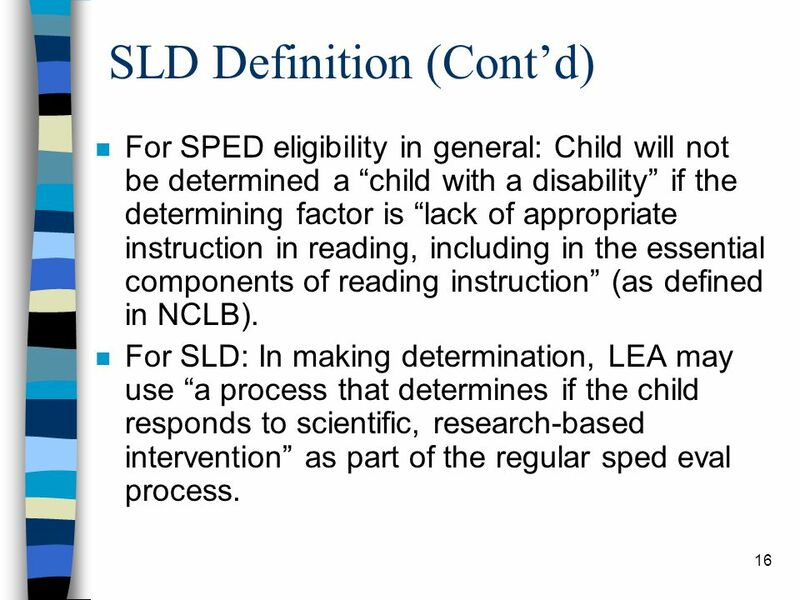 n For SLD: In making determination, LEA may use “a process that determines if the child responds to scientific, research-based intervention” as part of the regular sped eval process. 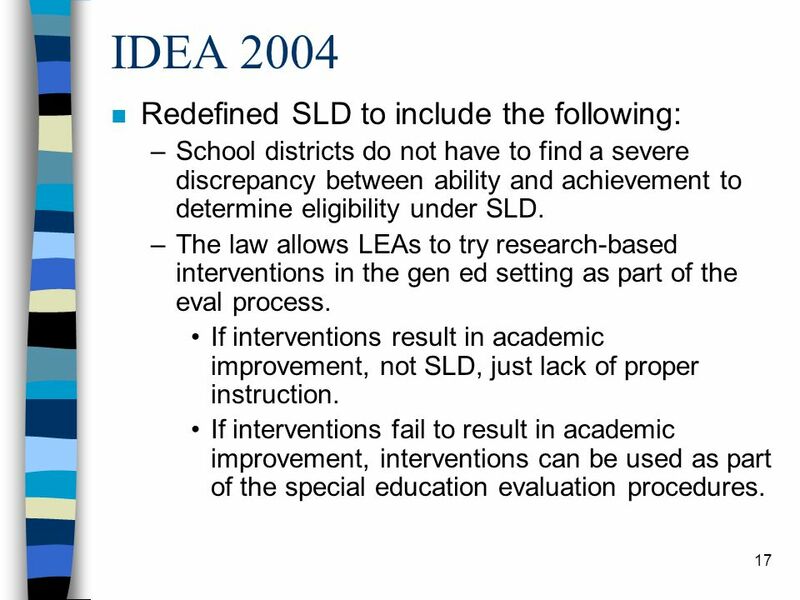 17 17 IDEA 2004 n Redefined SLD to include the following: –School districts do not have to find a severe discrepancy between ability and achievement to determine eligibility under SLD. 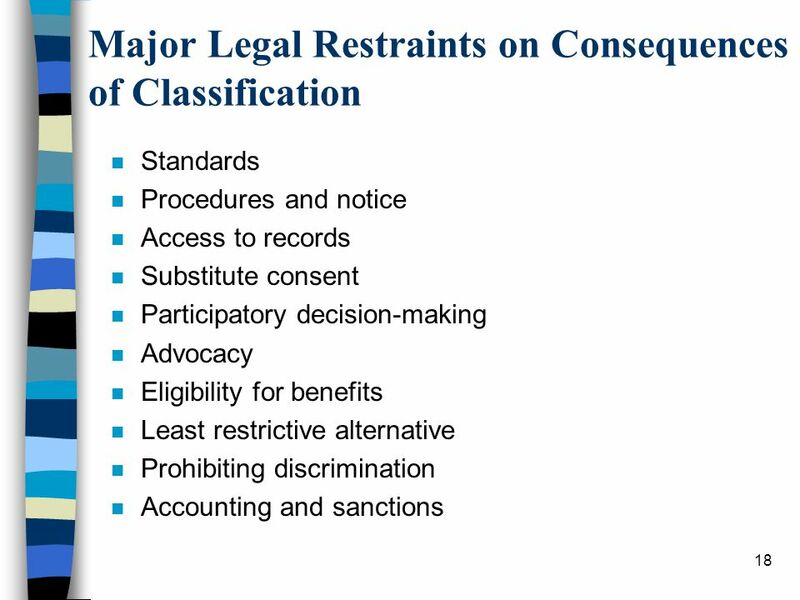 –The law allows LEAs to try research-based interventions in the gen ed setting as part of the eval process. If interventions result in academic improvement, not SLD, just lack of proper instruction. 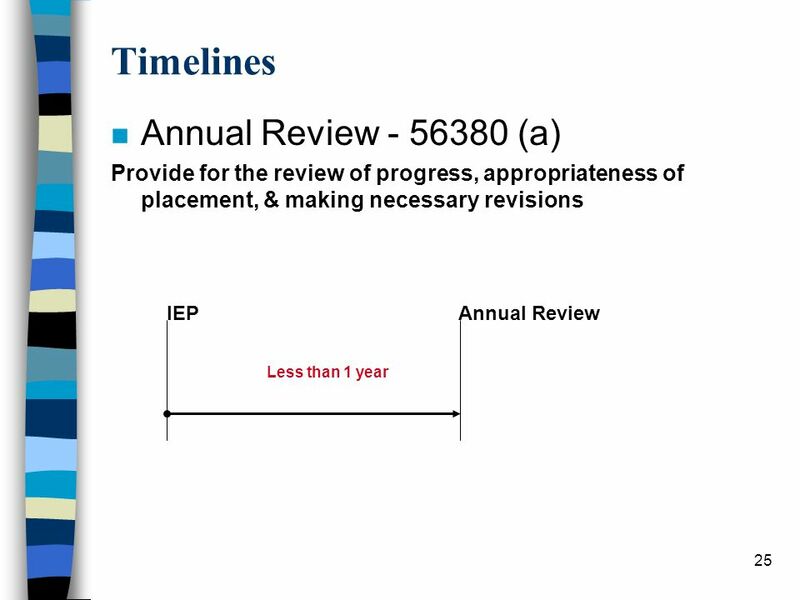 If interventions fail to result in academic improvement, interventions can be used as part of the special education evaluation procedures. 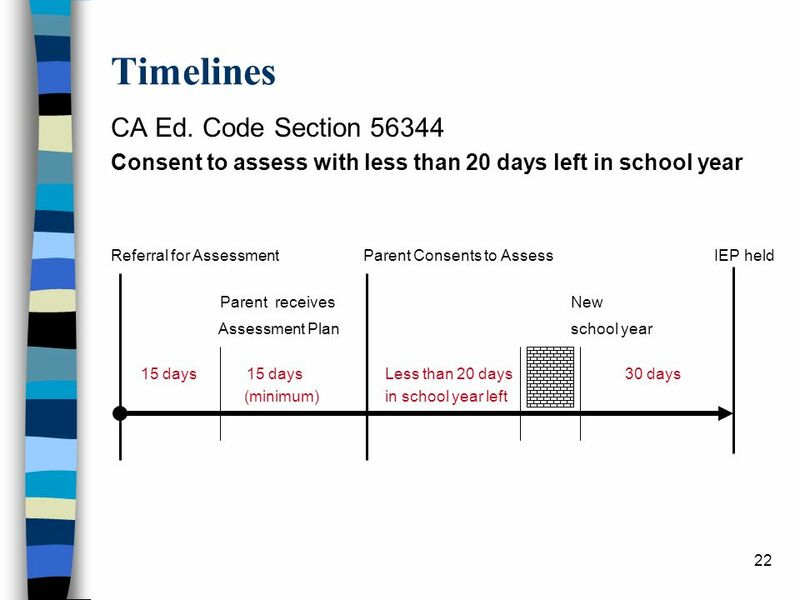 21 21 Timelines n CA Ed Code 56321& 30 EC 56043 Referral for Assessment Parent Consents to Assess IEP Parent receives Assessment Plan 15 days 15 days * 60 calendar days (minimum) * Not counting days between the student’s regular school session, terms, or days of school vacation in excess of 5 schooldays, from the date of receipt of parent’s written consent for assessment, unless parent agrees, in writing to an extension. 24 24 Timelines n *Interim Transfers - 56043 (k). 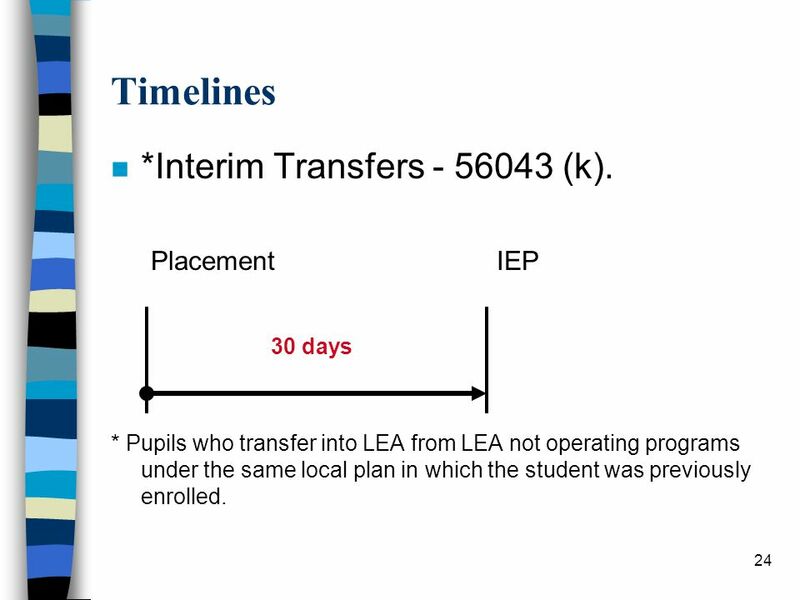 Placement IEP 30 days * Pupils who transfer into LEA from LEA not operating programs under the same local plan in which the student was previously enrolled. 27 27 Parent Initiates Due Process (30 EC 56043) Parent Initiates Due Pr.Final Admin. 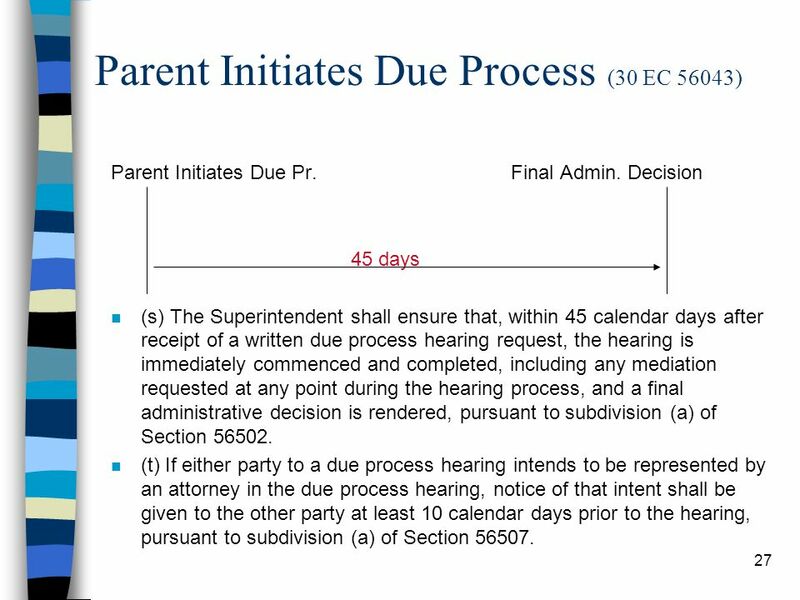 Decision 45 days n (s) The Superintendent shall ensure that, within 45 calendar days after receipt of a written due process hearing request, the hearing is immediately commenced and completed, including any mediation requested at any point during the hearing process, and a final administrative decision is rendered, pursuant to subdivision (a) of Section 56502. n (t) If either party to a due process hearing intends to be represented by an attorney in the due process hearing, notice of that intent shall be given to the other party at least 10 calendar days prior to the hearing, pursuant to subdivision (a) of Section 56507. 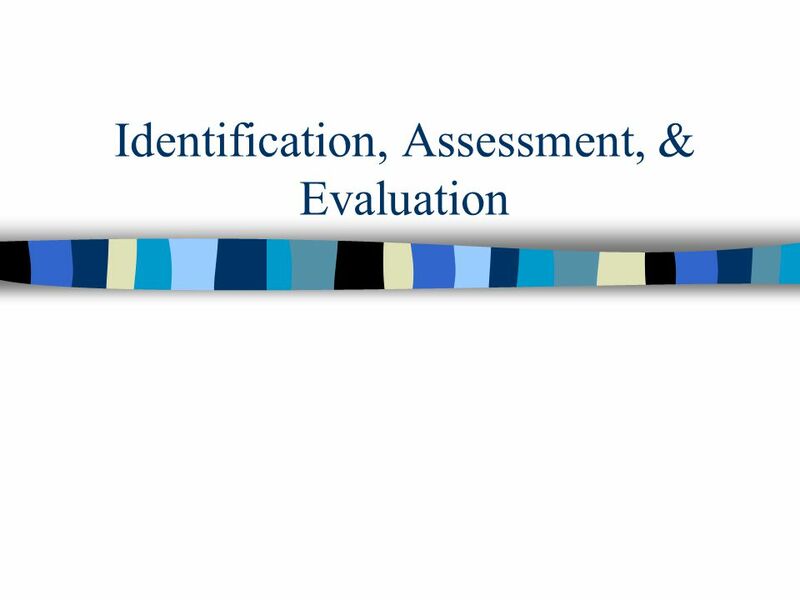 Download ppt "Identification, Assessment, & Evaluation. 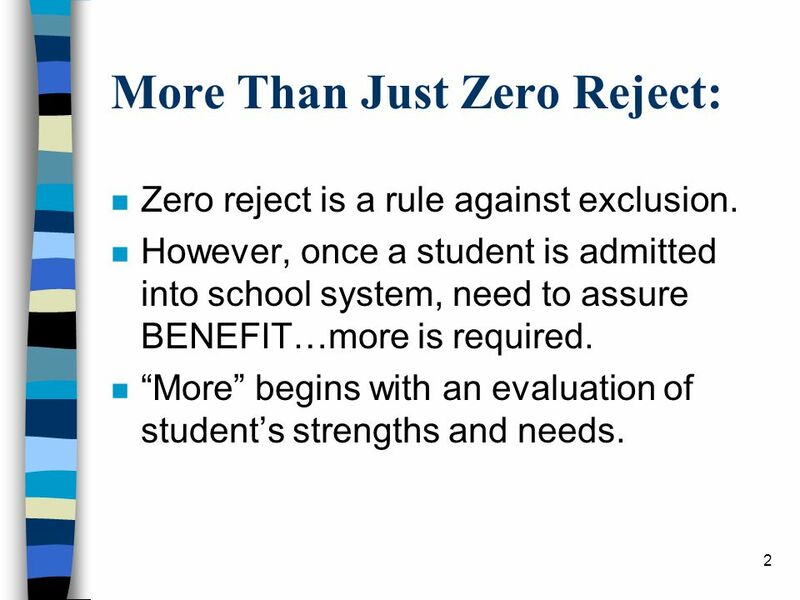 2 More Than Just Zero Reject: n Zero reject is a rule against exclusion. n However, once a student is admitted." Special Education 101 Special Education: A SERVICE, NOT A PLACE John Payne Office of Exceptional Children SC State Department of Education. 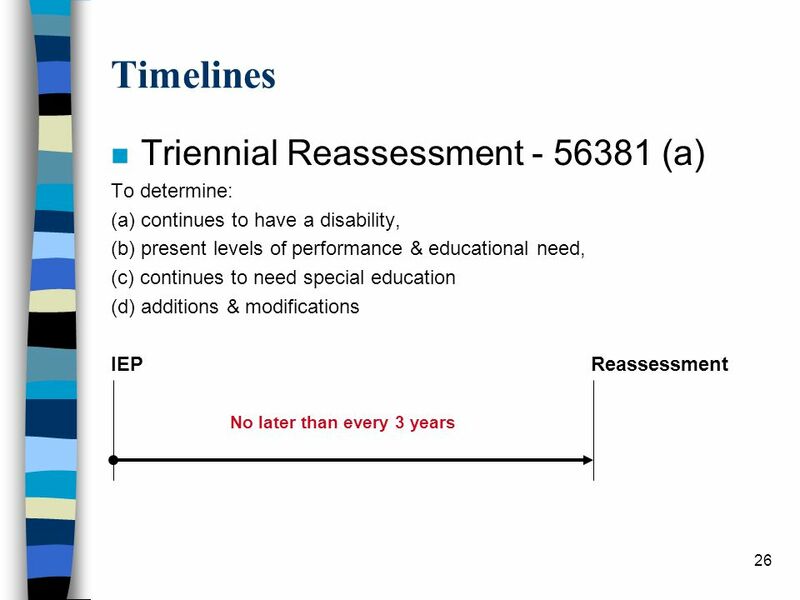 SPECIAL EDUCATION: What You Need to Know The Training Institute on Disability Rights. 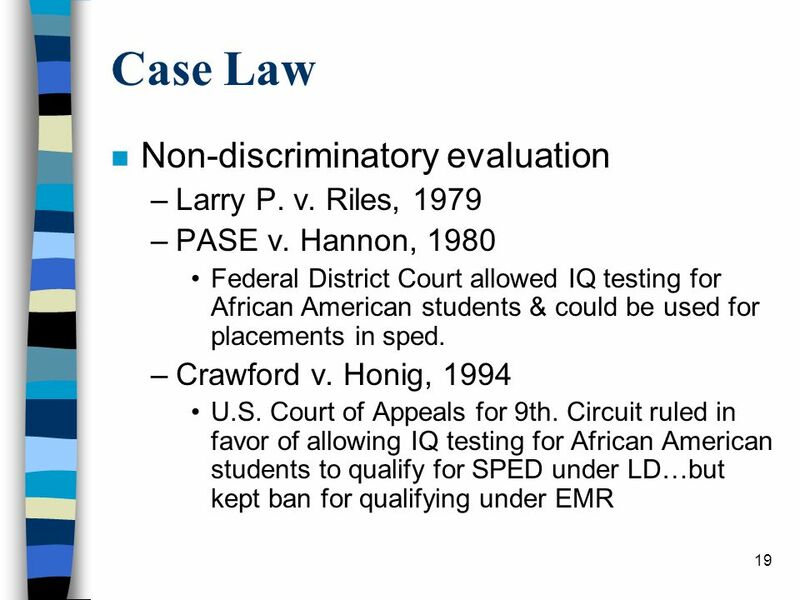 1 Issues of Law, Policy and Practice in Transitioning Students With Learning Disabilities to Higher Education Diana Pullin, J.D., Ph.D. Boston College.